Are you a gamer and in need of the best gaming desk which will be stable, robust and give you a lot of extra necessary space for gaming? Do you want to get rid of the typical and ordinary desk by replacing it with a real gaming computer desk? Don’t worry we have got it all covered for you as in this article we are going to discuss a lot about what makes gaming desks great and why you need them. We will also cover what the most affordable short budget gaming desks available on the market are. How Long Will Your Computer Table Last? But before we move any further, let’s take a look at some of the common factors that you must keep in mind before choosing a gaming desk for PC, PS4 or Xbox One! First, lets see the comparison list of the gaming desk we have reviewed. There are specific factors and things that you must look out for before choosing a gaming desk. These factors are as follow. First, try to think of what you actually will place on your new gaming desk. Do you use one or two monitors, or even three? Calculate the weight and keep it in mind, the monitors are usually what weights the most in your gaming rig. Often you place your actual computer case on the floor; if you use a laptop, the weight is not that significant. The reason you want to get a table that can easily take your weight is not that it will break in the middle. It’s because the table is not getting unstable and wiggly, and you definitely don’t want that as you play video games. A gaming desk is not like a standard desk. It comes with space that is more than enough, making it possible to store almost all of your gaming accessories. Gaming desks come in various ranges, sizes, shapes, and designs. It depends on you on what you use your desktop for, do you need space for several monitors, should it be height adjustable or do you need extra space for my laptop as well. Try to find a gaming desk that fits your needs and posture while sitting. You want a desk that provides your legs and gaming chair easily; you don’t wish to the armrest to touch the table first. When you have to bend your back in a curve to reach your keyboard, which is putting pressure on your backbone. Always prioritise comfort and convenience while you are gaming, try to plan and use breaks as much as you can. The first contender in our list of gaming pc desks is the brand new Arozzi Arena Gaming Desk, which has got a compact design with a lot of space available. The gaming desk is an ideal choice for many gamers who love more area in order to keep extra accessories on it or make extensive movements. Let’s have a look at some of the key features it comes with. Arozzi Arena Gaming Desk is one of the greatest computer gaming desks you will find on the market. The desk has got a stylish and slim design with a lot of space, and a good load capacity which is the main reason that you should go for it. The whole surface is covered in a giant mouse pad, which is removable as well. This gaming desk comes with a lot of space. It has got a 160cm/5.3″ width which is able to accommodate three large monitors without any issues. The depth of the gaming desk is also impressive as it has got an 80 cm depth, allowing you to have a large field of play for your gaming mouse, keyboard or other devices. The computer desk has got an aesthetic design. It has got a custom mouse pad design, which covers the entire table. With a microfiber cloth which is completely water-resistant. The desk can load up to176 lbs, due to the high-quality material construction. On the other hand, Arozzi gaming desk is available in five different colors, so you can choose which ones suit your room or office the best. The colors it offers are, Red, Blue, Geen, White and Black. The gaming desk is portable, besides accommodating an ample space. It is specially designed for easy transport as the top of the desk, and its frame are divided into three different sections. Arozzi Gaming Computer Desk offers a lot of space with many impressive features. It has got a surface of a custom mouse pad, with water-resistant ability as well. Having a large weight capacity, and a good portability option, this gaming desk is the topmost priority for many gamers. It can accommodate 3 large monitors. Surface of custom mouse pad. Tribesigns has been making some really good computer desks for quite some time now, and the tables produced by this brand comes in with a unique design and high-quality construction. This computer desk is a pioneer of it. The PC desk has got a good load capacity with a lot more features as well which are discussed below. Tribesigns Desk Computer Table has got a lot to offer in a good price range. The stylish design, high stability and ability to bear a lot of loads makes it one of the topmost picks for many gamers out there. Go for it if you need a simple, yet sleek and durable gaming desk with a reasonable price. The computer desk has got a compact and portable design with a unique construction which gives an eye-catchy look. It has got metal legs with adjustable leg pads as well which makes the desk stable on uneven floors easily. The PC gaming desk is 23.6″ wide providing space for the computer, monitor, printer and a lot of other gaming stuff as well. It has got a leg distance of almost 50.79″ which makes it perfect for tall people allowing them plenty of room. The desktop is super sturdy and durable thanks to its premium quality construction as it has got 0.98″ thick laminated MDF as the table, which is waterproof and anti-scratch features as well. The frame of the desk is made up of heavy-duty steel which makes it more stable and durable. Tribesigns desk computer has got an easy assembly process. You just have to install the 4 legs and the 2 leg bars with a hex key to make the table functional. Attach the table, and you are ready to go! The computer desk is also abundant with its 55″ in length, 23.6″ in width and 29.2″ in height respectively. It has got a load capacity of 900 lbs which is quite exceptional for a PC desktop. The computer desk has got a lot to offer. It ensures superior stability, rugged design and a high-quality construction which is able to bear a load of up to 900 lbs easily. These are some of the reasons to go for it. Load capacity of 900 lbs. The tabletop is not as silky smooth as you might expect. If you are in need of an L-Shaped gaming desk, the brand Tribesigns got a very modern desk for you in this regard. The computer desk has got many amazing features and is available in a medium budget range. The design is functional & smart, and the desk will provide you with a lot of open space. As its an L-Shaped desk, you can fit much more surface more useful in a smaller area. Let’s take a look at some of the key features it comes with. Tribesigns Modern Desk is a computer desk which can accommodate a lot of stuff with its large surface and durable construction. Go for it if you need a compact sized PC desktop in a medium budget price range. The computer desktop has got an L-shaped design and comes with a free CPU stand as well. The desk is made up of E1 class partial environment protected board with thicker steel for a more rigid and sturdy look. Due to a unique design, this gaming desk provides a spacious desktop with a lot of space, and it adjusts in a small area of a room without any issue as well. You will have plenty of space to place 3 to 4 monitors, and a extra laptop on this computer desk easily. The desk is super sturdy. It has got a rugged mechanical design with a thick steel frame to make sure that it provides the maximum stability to your PC gear and other stuff. It comes in with easy assembling. You’ll get all the parts, tools and instructions so that you can quickly assemble it without any problems. Well, the design of the table is large as it’s 66.14″ in length, 49.21″ in depth and 29″ in height respectively. The desk comes with an 18-month parts warranty as well. One of the most amazing features, why PC users love this desktop, is its ability to fit into a small room area. The desk is large enough to allow you a good space to place all your accessories. These are some of the reasons to go for it. Comes with a CPU stand. Load capacity of 450 lbs. Some gamers heavily invest in their gaming setup and make sure they a have a large budget to buy the best gaming desk out there on the market. Well, for these gamers we have got some good news. The ApexDesk Elite Series is the most versatile gaming desk you will find in a rather high price range. However, it’s definitely worth it because of its high quality, memorized height adjustable and sturdiness. Let’s take a look at some of the key features offered by this gaming desk. ApexDesk Elite series is one of the most expensive gaming desks you can find on the market, but also the top one we ever reviewed. The gaming computer desk comes in a stylish design and has got a great load capacity as well making itself a top-priority for many dedicated gamers or PC users. This gaming desk has got the ability to adjust the height. You can easily change the height of this desk from 29″ to 48″ in accordance to the height off your chair or your actual height while standing up. The desk has got an enhanced stability feature. A solid one-piece steel beam is included in this desk to provide you with extra stability. The gaming computer desk has also got dual motors with a load capacity of 225 lbs which is quite exceptional for an electrical table. It has got an easy assembly. Most of the gamers and office users can easily assemble it in under 30 minutes. There are no complex installations as might think because of the motorised desktop, and that’s the main reason for its easy assembly. ApexDesk Elite gaming desk has a 1″ thick and 71″x33″ tabletop, constructed on an ergonomically-shaped MDF. The top of the table is scratch-resistant with a high-pressure laminate as well. The gaming desktop has got a modern design. It is operated on electricity by dual motors, and it has got a lot of space. You can easily place 3 monitors at the same time on this table without any worries. Furthermore, the pro aesthetic construction will make you fall in love with this computer desktop. Dual strong motors for a high load capacity of 225 lbs. If you are looking for a durable and ultra-reliable gaming desk with a simple yet unique design, ApexDesk Vortex is an ideal choice for you in this regard. The PC desk comes with a premium touch, and it is a perfect choice for gamers as well. The computer desk showcases some excellent features, like electric height adjustable. Let’s take a look at them. ApexDesk Vortex Series is a gaming desk which has got a lot of load capacity. It is able to provide high stability, and it comes with an electric height adjustment feature as well. Go for it if you have got enough money to spend on a sturdy and scratch resistant gaming computer desk. The most significant feature in this gaming desk is its height adjustability option. You can quickly adjust the height of this desk from 27.5″ to 45’5″ in accordance with your chair for more comfort and convenience. As we said above, this PC desk has got a high-quality construction. It has got a sturdy industrial-grade aluminum underframe which makes it superiorly stable. The computer desk meets the requirement of ANSI/BIFMA standards as well which means you will have a peace of mind as you purchase this computer desk. The desk is 1″ thick and has got a top of 59″x29.5″. The top is scratch resistant with the presence of high-pressure laminate. There are two 80 mm grommets available with adjusting leveling studs, and the desk has also got a memory controller with anti-collision function. Which means that you can pre-install different heights, and quickly switch between them with a click of a button. In short; the gaming desk can accommodate a sufficient amount of load with its high-quality construction. Its height is adjustable, has got a flexible design and a scratch resistant top which is some of the reasons to go for it. 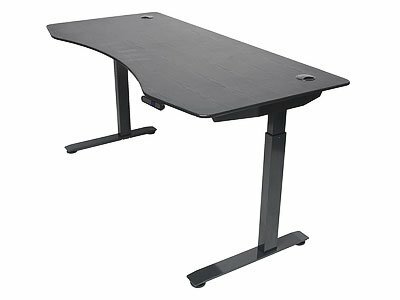 Atlantic gaming desk is what most gamers call a feature-rich gaming desk as it has got so many features in a very reasonable price range. Our favorite gaming desk under $100. The gaming desk has got a smooth design with a unique shape, and lot of space accessible to accommodate a large monitor and extra laptop as well. Let’s take a look at some of the key features it comes with. Atlantic Gaming Desk is one of the best cheap gaming desks available on the market right now. So, if you have got a tight hand on money, you need to go for this gaming desk as it’s very affordable and offer some quite astounding features. The gaming desk is specifically designed to accommodate all of your gaming stuff and gear so that you can play the games all day long without any interruptions. The computer desk is feature rich. It has got a charging stand for smartphone or tablet, speaker stands, game storage space, a basket under-desk, stand for controllers and built-in power management. The PC desk comes up with a monitor and smartphone stand as well. The stand can be used to attach a monitor of up to 32″ easily, and you can also charge your cell phone or tablet on the stand as well. Besides having all the features, the gaming desk covers a tiny area in the room. So, you might have a small room in which you only need a small desk; this gaming desk will be the perfect choice for you thenThe desk has got a surface of charcoal colored plastic, looking like carbon fiber material which makes it seem more sturdy and rigid. It has got a length of 15.5″, a width of 7″ and height of 6.25″ from the desktop. The cheapest gaming desk we reviewed, has got so many features which are perfect for a gamer. The feature-rich quality and a reasonable price range are some of the reasons to go for it. Stand for monitor and cell phone. Another L-Shaped computer desk on our list is the brand; Best Choice Products Table, which is a sturdy and straightforward PC desk with a silver and black design. The desktop is able to provide you with a large area of space as its L-shaped, in a smaller room. Let’s take a look at some of the best features it comes with. Best Choice Products have introduced a solid L-shaped computer desk in a reasonable price and with some cool features. The PC desktop is able to provide ample space for users, and that’s why it has got much popularity with great reviews. The computer desk is constructed with a modern and sophisticated design so that you can add a professional appearance to your room at home or in the office. The frame of the desk is sturdy enough as it is designed with an industrial and architectural look to support all your gaming demands. There is a slide-out keyboard drawer available which lets you place your keyboard in it comfortably. There is a stand for CPU as well which can be utilized by placing the gaming pc on it. The PC desk is durable as it has got high-quality construction. It has got a unique design which is able to blend in any type of environment as well. The computer desk has got a length of 59″ a width of 55″ and a 29.5″ height. In short: This desk is for people who want a large space from a counter so that they can place their gaming accessories on it easily. The computer desk is made upon a modern design and has got an L-shape as well. Tribesigns Office Desk is second last on our list as many people have shown their interest in buying this working table. Like other Tribesigns models, this one has also got a classic design, with some features to offer and a good loading capacity as well. Let’s take a look at some of the key features it comes with. Tribesigns Computer Desk is a PC office table available in a good price range. It has got a simple design, with a clean finish which makes it worthy of buying. Go for it if you need a standard computer desk in a reasonable price range. This model of desk got a simple, yet luxury looking design it is made on modern architecture. The office desktop comes with metal legs and adjustable leg pads for keeping the table stable on uneven floors easily. The table has got an ample of space for computer and monitors etc. as it is 23.6″ wide. On the other hand, it has got a gorgeous wood tabletop which is scratch and water resistant. The heavy duty powder coated steel frame with a triangular junction design makes it super sturdy. The table can bear up to 900 lbs of weight effortlessly. The computer desk has got an easy assembly as well. You can assemble this table in a couple of minutes without any issues. The large size of the table makes it more popular as it has got a length of 63″, a width of 23.6″ and height of 29″ respectively. Tribesigns is a brand of quality and trust. The PC desks made by this brand are sturdy, durable, stylish at the same time. These are some of the reasons to go for this desk. Frame is coated with powdered Steel. Some screws are hard to reach. Well, if you are in search of a desktop which is able to fill the space of the corner in your room, Bestar Hampton workstation is the perfect choice for you. This PC desktop is specially made to adjust in, and that’s the main reason for its popularity. It has got so many features to offer. Let’s have a look at them. In the race of luxury desks for corner spaces, there is no comparison of Bestar Hampton workstation. The table is available in a reasonable price range, and you must go for it if you need a nice looking corner workstation for your computer gear and such! The PC desk has got a minimalist and modern design with a high-quality finish which makes it look like sand granite. This desk provides a lot of space as it is 70.1″ wide. You can easily place up to 3 monitors on this table. One of the best features about this workstation is its ability to fit in corners. If you are keen on setting up your computer setup in the corner of your room, this table is the choice for you. The high-quality wood used in this workstation makes it more durable and able to bear a lot of load at the same time. The gaming desk got 35.4″ of length, 70.5″ in width and 35.4″ in height respectively. The features above describe the importance of this particular desk. It is the most suitable option for PC users if they want to fill the space in the corners of their rooms or offices. A wide size, ability to bear a significant amount of weight and stylish design are some of the reasons to go for it. 3 monitors can be placed on this table. Doesn't look good in the middle of a room. There are two pretty tricky choices a gamer has to make. One is to choose the gaming PC with gear, and the other one is to select the gaming desk to make his or her gaming rig complete. Nowadays, there are so many gaming desks available that one can get easily confused about making a good choice. To avoid this problem, we have decided to write this complete buyer’s guide so that you can have proper knowledge about gaming desks and its benefit. There are various types of gaming desks available. Some of them are listed below. Standard Desks: These are widely used gaming desks and are used for different works as well. They have got a simple shape like most table does. L-Shaped Desks: As from the name, it is clear that these tables have got an L-shaped. They provide a large space and require less area to fit as well. This type of desk usually works excellent in the middle of the room and does not necessarily have to be put in a corner against the walls. Corner Desks: Corner desks are specially made for gamers who want to build their gaming rig in the corner of their room. They are like the L-shaped desks but are different in features and position possibilities. Like every other furnace you have in your home or office, you want it to match or look good in your environment. You wouldn’t buy a dining table that you didn’t think was visually appealing right? We just want to push the importance to have a look at the points above, after you found your gaming table. After these important factors, we came to the main topic which was reviewing some of the top computer desks on the market, so that you could browse between the winners according to your needs and budget. These gaming desks are appropriately researched on the basis of their ergonomics, user-friendly options, reviews, durability and quality of the construction materials so that you can choose the one that fits you the most. Well, your computer table will probably outlive your computer. The gaming desks made up with high-quality materials such as coated powdered steel, MDF or aluminium tend to last longer than these made out of poor quality. Similarly, if you regularly take care of the maintenance of your computer desk, it will last likely for a far more extended period. So, it is entirely up to you to enhance the durability of the gaming desk. Gaming desks have got a lot of benefits. Some of them are as follows. With the help of a gaming desktop, everything is easily available. You will not have to move your chair to find your other gaming stuff such as headphones, keyboard or mouse as they will be already present on the gaming desk. Gaming desks help you to keep everything in one place and order. You will not lose your stuff anywhere whenever you are using a computer desk, as it provides ample space and width to keep all the things in one place. One of the most important benefits of a gaming desk is the cable management. With the help of a computer table, the cable management becomes more comfortable and convenient. Many desktops even have a net under the table, where you can attach various cables and power bars conveniently. As a good gaming desk will provide you with outstanding comfort, nice little extra features like this only add to the experience. Always choose an ergonomic gaming desk, so you don’t have to crawl around to reach cables, keep them optimally in once place. Well, a computer desk might be the thing the impacts your gameplay the least of all the gaming gear available. But still, it has a slightly important role while you are playing the games. It helps to improve your whole concentration on the screen; the desk will provide you with comfort and convenience, which will enhance your productivity in gaming. Desks are an essential component for every dedicated gamer, and many players know the importance of a gaming desk with a lot of useful features. Unfortunately, some people cannot find a good gaming desk within a reasonable budget and to avoid this issue; we have reviewed some of the most popular gaming desks available for you from almost every point of view. The choice is now yours to make. 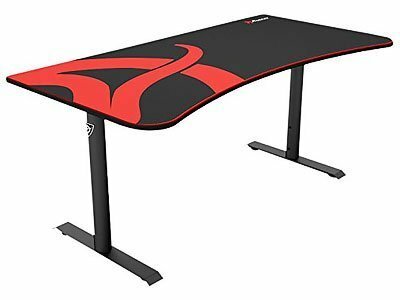 If you still face any difficulty in picking up a gaming table, we will recommend you to go for the Arozzi Arena gaming desk for pure PC & console gaming; it also has a reasonable price tag as well. For gaming and everything else, we would recommend the more premium chose of ApexDesk Elite Series. 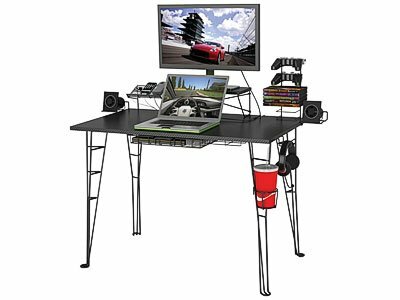 It’s an electric height adjustable desk which will help you move around for both work, entertainment and gaming. We wish you good luck in making the perfect choice according to your requirements and budget.